Anybody who has ever been in a band can relate to tales of bad auditions. American Idol’s early rounds are a testament to the mind-boggling number of talentless, delusional individuals who think they are to be The Next Big Thing. My band Burstweazel (1986-1988) encountered scores of these shameless wanna’ be’s in its search for a singer. Some outright stunk; whereas, many of them who did possess some ability had abrasive personalities — the infamous singertude. It appeared that talent and affability were mutually exclusive traits. In coping with this prolonged, seemingly hopeless endeavor, we gave nicknames to the legions of tone deaf balladeers and pompous fools who made their way into our cozy studio. There was Backdoor Willie, Lizard Boy, Teddy Ruxpin, Todd the Wad, Mr. Digital Delay and Record Contract Guy, to name a few. Sometimes these folks come back to haunt you. Among the most memorable of our ill-fated prospects was Geoff Clark, a.k.a. 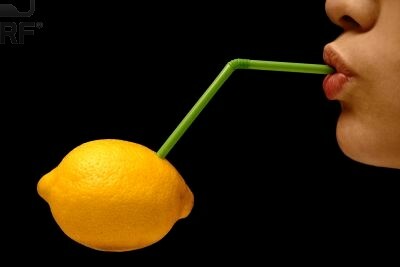 the Lemon Sucker. 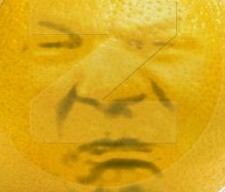 Clark’s bizarre pre-audition rituals included sucking the sour juices from halved slices of the dirty, yellow fruit, claiming they cleansed his vocal chords. Unfortunately, clean pipes didn’t compensate for a general lack of ability, so we said thanks, but no thanks, and took a pass on him. Eventually, we found our man, a singer who played a solid guitar, and we were ready to gig. Several months later, Geoff Clark called out of the blue to tell me that he was throwing a huge party at one of the city’s major venues and was offering us thousands of dollars to play there. Prolly too good to be true, I thought; but considering that the phones weren’t exactly ringing off the hook with offers, we decided to at least go hear him out. Our drummer, Scott, and I met the Lemon Sucker at a park. Despite having short hair, Geoff was trying very hard to look the part of a glam rocker, wearing checkered spandex riding pants and eyeliner. He then led us to a nearby house where he was staying. The three of us took seats around a kitchen table to talk business. He drew our attention to the book at his fingertips, The Power of Positive Thinking, his inspiration and salvation, he proclaimed, before starting his pretentious pitch. Geoff handed me a professionally printed ticket with the words “Possum Stomp ’87” emblazoned across the middle. I noticed that our band, Burstweazel, had already been printed on the ticket along with two of the area’s more popular cover bands. It was to take place at the Cheeseborough Performing Arts Center, a 17,000-seat auditorium downtown that hosted many premium touring acts of the day. I didn’t know whether to be indignant or flattered by Mr. Clark’s presumptuous actions. Nevertheless, we listened to his plan as he revealed it. He admitted that he had not yet contacted the other bands as either. But despite our relatively unknown status, he was giving us top billing. He wrote $5,000 on a scrap of paper as an offer of payment for our services. There was one unknown band on the ticket, River of Tears, which the Lemon Sucker explained was his band. Geoff confided that his fiancé had broken up with him, and the name referred to his profound sadness and unending tears. Interestingly, this band did not actually exist. He was to be the singer and he proposed that Burstweazel serve as his back-up musicians. We would be learning about 10 of his originals to perform at the show. “How much would you require for payment, if you were to do this?” he asked. I wrote down a figure on the scrap paper. . . . The guys broke out in uproarious laughter. I explained that if he were willing to pay us $5,000 to perform our own material, he should expect to pay us double to learn a whole new set. This sounded completely reasonable, of course. The humor lie in the fact that everything proposed in this meeting was utterly preposterous — a pipe dream! As Scott told Geoff Clark, there would be no way he could generate enough income to cover the rental fees associated with the Cheeseborough Center – not with two cover bands and a few unknown acts. Who would fork over $20 a pop to see bands that they could see five days a week at area bars. “I suggested that he hire a national act,” Scott explained, “then he would at least have a chance of selling enough tickets to cover his expenses.” Scott was smart like that. He was the most business savvy among us and was the closest thing we had to a leader. “Could you handle it to the tune of 10 grand?” Giglimo, our guitar player, quipped. Despite the implausibility of the entire proposal, Clark had implored us to check with the folks at Cheeseborough to verify that the event was legit. This would not be a problem. We just happened to be going there anyway for a Battle of the Bands briefing the very next evening. It was as if all the freaks in the city had converged upon the Cheeseborough Performing Arts Center for the Big Pow Wow. Glam bands, pop acts, blues trios, heavy metal shredders, jazz ensembles and hip-hop groups were all represented, sitting together in one section of the spacious, otherwise empty concert hall. During the preceding months, more than 90 bands in three states competed at preliminary events held at various locations. Burstweazel had qualified during its maiden performance at a local college. We were one of 16 groups selected to battle it out in this huge final competition. The event organizers had filled us in on how the evening would unfold. We would sell tickets and could earn commission on our sales that would apply to our fees. In all honesty, the logistics involved in putting together 16 amateur acts was quite an undertaking. There was much that could go wrong, but it promised to be an evening to remember. We were then introduced to Bruce Winters, the venue manager, who told us more. It was a dream-come-true being there. During an idle moment, I walked out on the same stage where I had seen many of my favorite bands perform over the years. 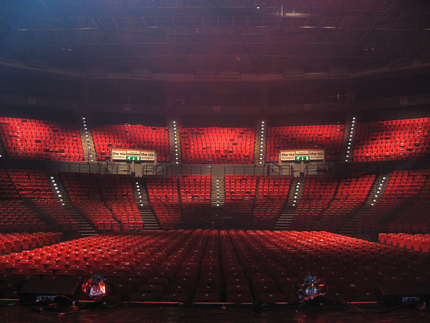 Awestruck, I looked out into the vast expanse of empty seats before me. In less than two weeks, we would be playing there! I envisioned performing our songs before a huge, receptive crowd, my bass thundering through the huge hall via stacks of giant speakers. In the interest of brevity, I gave Bruce an abbreviated version of the story, leaving out the whole lemon sucking bit, his endorsement of The Power of Positive Thinking and the part about the depressing ballads. I made it known that we were not consulted about having our band’s name printed on the tickets. A few nights later, we were practicing in our studio when we got a phone call from Giglimo’s boss. The evening news had just aired a story warning people of the fraudulent Possum Stomp concert. They showed a close up of a ticket – most likely the one I had given to Bruce Winters – which listed Burstweazel as the headliner for all of TV land to see. Then a few days later, the newspaper ran a story about the bogus tickets and efforts to prosecute Geoff Clark, who had been arrested on unrelated burglary charges. Apparently, he attempted to pawn off jewelry he had swiped from the house where he was staying. Despite having a good laugh, there was cause for concern. We were currently selling tickets to two shows, the Battle of the Bands Finale and an outdoor concert gig with Gethsemane, some of Scott’s friends. All this negative publicity was threatening our legitimate ticket sales. By strange coincidence, while all this was unfolding, I had inadvertantly startled a bum who was sleeping in a friend’s shed. In his haste to flee, he left behind his copy of The Power of Positive Thinking. I immediately recalled our meeting with Geoff Clark and his testimony that the book had turned his life around. If I hadn’t known better, it would appear that positive thinking leads to prison time and a life of destitution! This is a pretty funny story, hah. I hope all works out with your shows. This entry was posted on June 10, 2010 at 11:29 pm and filed under Narratives,Silly Crap. You can follow any responses to this entry through the RSS feed.